QuietOn active noise cancellation reduces low frequency noise that normal earplugs can’t block. Are you a light sleeper? Does the sound of your partner snoring keep you up at night? These earplugs may make it easier for you to sleep through the night. Finnish company QuietOn is hoping to restore harmony in the bedroom with its latest invention, the QuietOn Sleep. 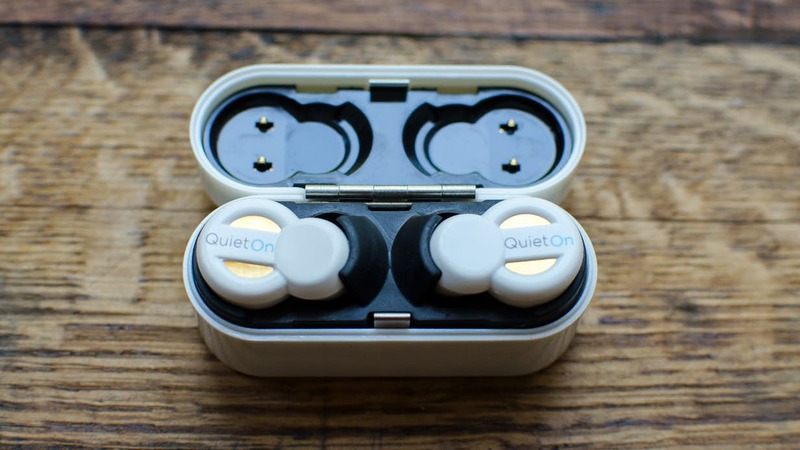 QuietOn made its name with a set of noise-cancelling earplugs, designed to drown out the sound you endure while on a plane. Since they pack active noise cancellation to really make things quiet. These earplugs can be used at home, at work, on the bus, noisy coffee shops and anywhere else you may go. With 50 hours of use on a single charge, QuietOn has the longest battery life of any wireless noise canceling device. The included carrying case also functions as a convenient charger, and features indicator lights on the front that let you know when it’s done charging. The Sleep edition of the earplugs uses the same principle, as they are engineered to keep things quiet while you’re getting your snooze on. The hardware is significantly smaller in order to make it comfier to wear in bed. In addition, the set comes with pass-through mode, disabling the noise cancellation with a tap of the bud. If you want more information on the wearables, and on the company, then you should check out their Indiegogo page. The company is raising funds through a pre-order campaign on Indiegogo, with early birds able to grab the gear for $109.